Susan Blomley has designed a beautiful butterfly Etui, which appears difficult however, is actually takes only about 12 hours to complete. The keepsake case measures 6” x 4 ½”. 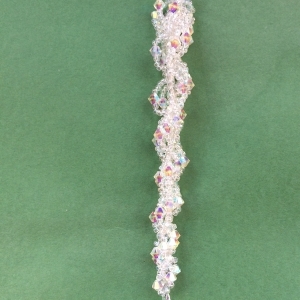 The stunning fabric in swirls of colors sets off the white butterfly to perfection. Inside a plain purple lining show cases the 4 small butterflies, one holds your favorite pair of scissors, and then the other are 3 are for different size needles. 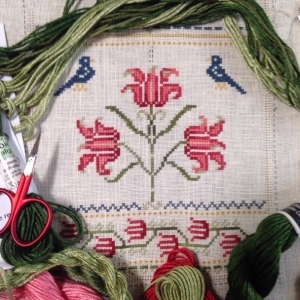 In class, you will lay tapes to make the shape and then fill in with decorative stitches. You will have learned everything you need to know to finish by the conclusion of class and go home with confidence to complete the project at your own pace. 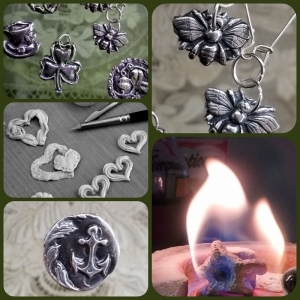 Don’t be intimidated by the appearance this can be done by beginner to experienced, however previous experience is a help if you want to finish more in class. 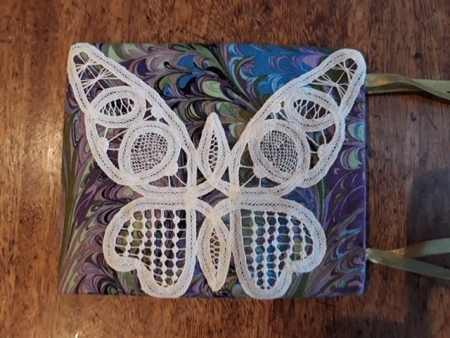 When you have completed your butterfly and attached it to your easy make case, you will love using it again and again. Stitches and techniques taught include: Battenberg work, Battenberg knot, running stitch, and filling stitches. 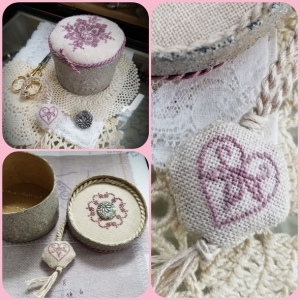 Kit includes: Tape lace, calico with pattern, fine thread, DMC Cordonnet, instructions, fabric and lining, interfacing, needle felt. Bring to class: Very small bottle of fray check. Sharp needles, light coloured thread for tacking, scissors, any other supplies normally in sewing box. Bring extra lighting and magnification if needed.